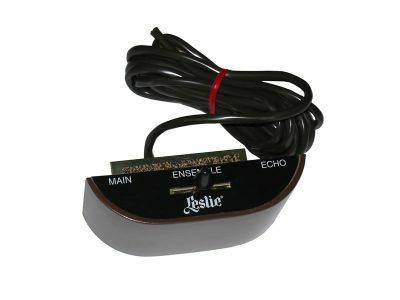 This switch gives you the ability to hear either the Hammond Tone cabinet speaker or a Leslie speaker, or both of them. This half-moon switch mounts on the front rail of your organ. This switch is wired into an optional accessory kit that may or may not be installed on your organ. This switch cannot be used to select two Leslie’s speakers. We recommend that a factory-trained technician install this accessory.